Cultivate a desire to think critically and respond with clear, truthful, and creative expression. Develop and exhibit empathy, compassion, and respect for others. Delight in all of God’s creation by developing stewardship – of minds, abilities, resources, time, and surroundings. Know whose they are so they can respond with integrity in God’s world. We incorporate our Christian faith into EVERY class. ALL subjects are taught from a Reformed, Christian perspective. The school is located just south of the city of Grand Rapids, and draws students from city, suburban, and rural areas. In the early 1950s a group of visionaries saw the need for a Christian high school in southern Kent County. 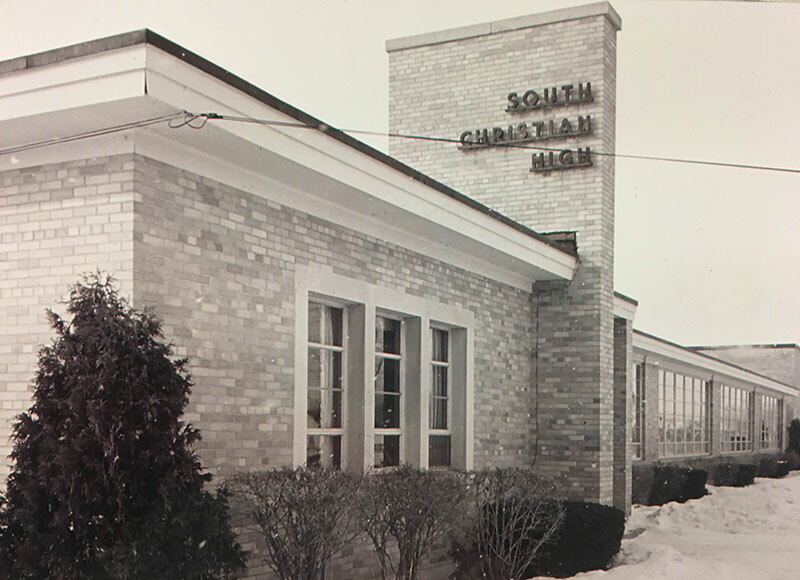 God blessed their planning and 109 10th and 11th graders entered South Christian High in the fall of 1954. The following year the 12th grade was added, and SCHS remained a three-year high school until 1992 when the 9th grade was added. More than 10,000 students have graduated from South Christian. In 2004 the community celebrated the 50th anniversary of SCHS, recognizing that God has blessed this school. South Christian has a rich history of growth in which it experienced a steady increase in numbers to a peak of 834 students in 2001. A series of building additions, a continual revision of curriculum offerings, and an upgrading of technology accommodated the increased enrollment. Because of a dire need for athletic facilities and a long range plan to build a new school, 130 acres were purchased on Kalamazoo Avenue between 76th and 84th streets. A beautiful sports park which includes facilities for tennis, soccer, baseball, softball, lacrosse and cross country, now serves a thriving athletic program. In February of 2016, the SCHS Board unanimously voted to accept the single, largest pledge in the history of South Christian High School. This generous gift is designated for a new facility on the Kalamazoo Avenue property. We are overjoyed about the opportunity that a new facility will afford to equip students to live Christ-centered lives and serve him to the best of their abilities. SCHS provides a rigorous and varied academic program. A schedule of vibrant chapels and a school life infused with the Reformed faith fosters spiritual development and a positive social atmosphere. All faculty members are certified by the State of Michigan and more than half have both a bachelor’s and a master’s degree. They all profess Christ as their Savior and are dedicated to accomplishing the school’s mission — to provide a Christ-centered education, equipping students to serve God to their greatest potential. We thank and praise God for his faithfulness to the South Christian community for the past 60+ years.